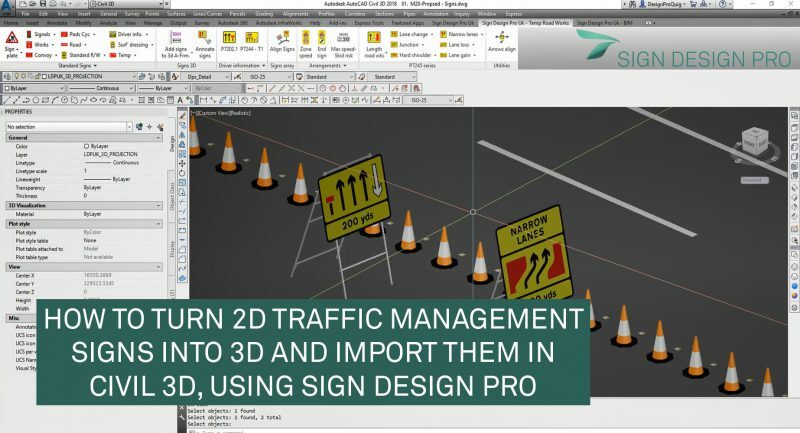 This video shows how to turn 2D Traffic Management signs into 3D using Sign Design Pro Uk and how it will automatically be imported as a Civil 3d surface. We have developed One button press technology for conversion to 3D: After inserting the desired sign face in 2D, and tagging it as an assembly, the user then selects the mounting type they want the sign to be on, in this instance a Morlock A-Frame and then the sign is turned into a 3D block and sent to the correct location on the plan. Id detected in the drawing the user is additionally prompted to have the sign sent to a Civil 3D surface. From two 2D signs fully designed to a 3D sign face positioned at the correct chainage and level the process took 80 seconds, or 40 seconds per sign. And one final point, our 3D blocks are drawing objects, and do not require the use of object enablers.